Post-Script: Typecast via Royal Mercury. 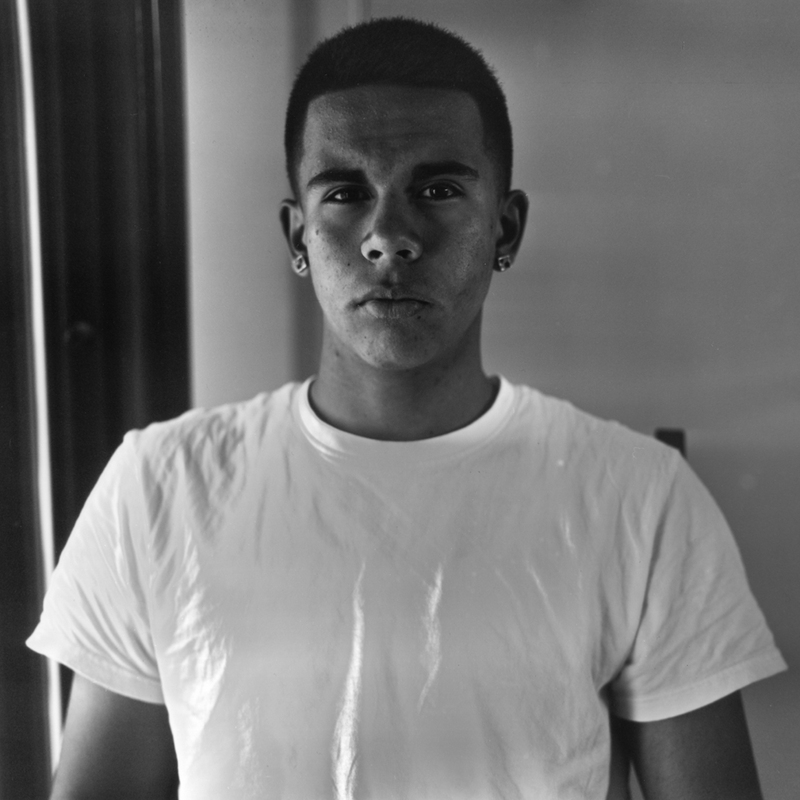 Images are scans of 8"x10" enlargements onto Ilford MG-RC-WT paper. Recently I took the opportunity to visit an old friend that I haven't interacted with in some years, and the reunion went better than expected. It seems I'd learned a thing or two in the intervening years that helped us get along better than ever. No, that friend isn't a long-time buddy or relative, but a particular type of photographic film. "A film?" you're probably asking yourself. "How can a film be a friend? And what's the deal with the reunion?" I'm glad you asked. Back in the mid-2000s, I was heavily involved in pinhole photography, more so than today, and had, up until that time, been using primarily photographic print paper as a form of in-camera film, so-called paper negatives. 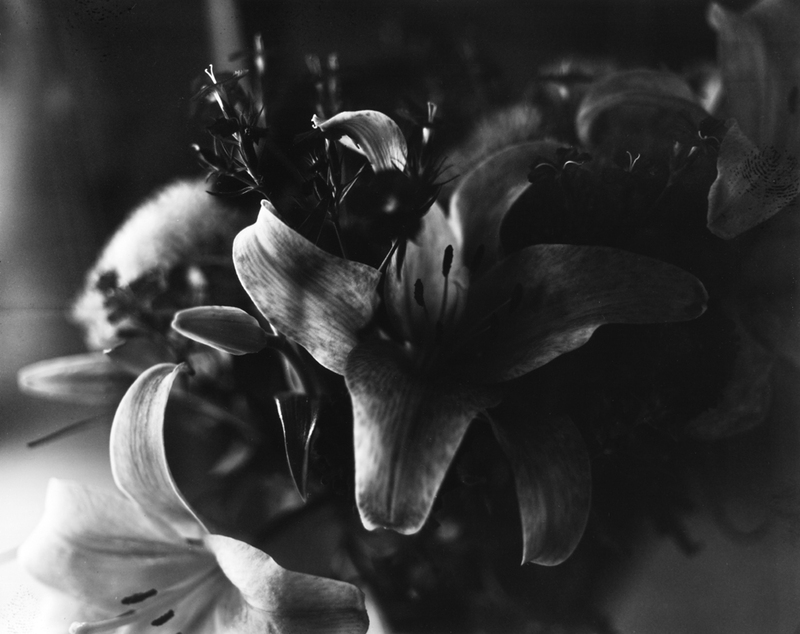 I had learned to work within the limitations of the medium to eke out as much as I could from its limited tonal range and high contrast emulsion. The advantages of paper negatives over conventional black & white film are low cost, ease of handling and use (due to its lack of red sensitivity, it can be handled and processed under red darkroom lighting) and relative insensitivity to dust, scratches or other physical artifacts of the process. The disadvantages are its limited tonal range, difficulty in controlling image contrast, slow photographic speed and inability to make enlarged prints with any degree of sharpness. Paper negatives lend themselves for use in large format cameras, and as an image capture medium for scanning and digital post-production (new film scanners aren't being introduced into the market, but flatbed scanners, perfect for reflection scanning of media like photo paper, are still easy to find). Then, at the suggestion of someone on the F295 pinhole photography discussion forum, I discovered APHS film. Arista Premium Halftone Supreme was an orthochromatic, high-contrast lithography film originally marketed by Freestyle Photo, intended for the graphic arts industry but discovered by many early pinhole pioneers to serve well as an in-camera film that, because of it transparent film base, served well for both contact prints and enlargements. 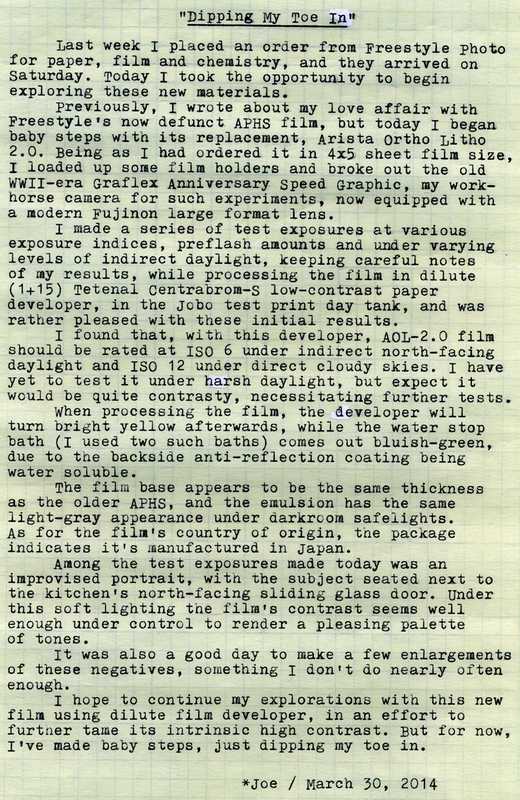 Some of the disadvantages of paper negatives were also inherent in APHS film, such as slow photographic speed, limited tonal range and difficulty in controlling contrast. But its few advantages, such as having a clear film base, lent itself for enlargement printing and contact printing using alternative processes, while its low cost made it a much more viable product for large format photography. Oh, about that issue of low cost, there's one important caveat I should mention, which is that APHS film has been off the market for some years now. Yes, that's right, it's long gone and I haven't purchased a pack of that film in a long while. But, looking through my film storage cabinet in my darkroom recently, I found two packs of the film, and my mind went racing with thoughts of what I could do with them. I had suddenly rediscovered my long-lost friend. The first thing I thought of was breaking out my two-inch-square format brass pinhole plate camera, that I had made back in my APHS days to take advantage of being able to both projection enlarge or scan with my 35mm slide scanner (a mounted slide being about two inches square in size). This was a little brass box with a light-tight lid on the side which, when removed, reveals a stack of brass plates and a rear pusher that keeps them tightly up against the film plane flange. In actual use out in the field, the camera is reloaded in a changing bag by swapping plates. I cut a few squares of this old-stock APHS and tried them out in the old brass plate camera, with good results. As it turns out, I hadn't forgotten what I had learned when working with this film years ago. In case you happen to find a pack of APHS film for yourself, here are a few tips I've learned over the years to help make your shooting experience a bit easier. *First, the film base is thinner than conventional large format film, so it might not sit well inside an 8x10 cut film holder. *It's also rather delicate when wet, so it scratches easily. *There are no notches to indicate which is the emulsion side of the film, but under dim red lighting, the emulsion side appears lighter gray than the reverse side. *It helps to preflash the film - give it a faint, even exposure of light in the darkroom, prior to loading it into your camera - to help tame its high contrast and get a bit more shadow detail out of the image without blowing the highlights - something I also do with paper negatives. Remember, this was originally purposed as a graphic arts film, hence intended to be high in contrast. *It takes well to dilute development to control contrast, but too dilute can cause a mottled, uneven look to the image. *Its emulsion is also sensitive to heat, so if you're processing sheets of APHS in a tray in a cool darkroom, leaving your fingers in the developer in constant contact with the film can leave dark smudges in the image where the local development preceeded at an accelerated rate. *Most importantly, APHS easily produces small pinhole defects in the emulsion if you use an acidic stop bath (caused by the rapid pH change when going from the base developer to the acidic stop bath producing hydrogen gas bubbles in the emulsion), so it's best to use a water bath as a stop and slightly shorten the developer time, while remembering to periodically replenish the tray with fresh water. So, with all of those limitations and caveats to working with it, is there any advantage at all with using APHS? As I indicated above, when it was available on the market it was very economical, and could produce very high resolution images, perfect for enlargement printing. If you happen to have a few packs of the stuff stored in your darkroom, as I do, then it's a no-brainer to want to start using it again. But with a limited supply, what happens when I run out? Well, as it happens, Freestyle Photo has introduced the replacement for APHS, that being Arista Ortho Litho Film 2.0. I have yet to try this replacement film, but if cost is any indication it promises to offer a thrifty alternative to using conventional sheet film. Let's compare the economics of various brands of film, with prices taken off Freestyle's website. Freestyle's own Arista house brand of conventional B&W film is priced at around 75-80 cents per 4x5 sheet, with Ilford's being almost a dollar and a half, and Kodak around two dollars per sheet. In contrast, the Arista Ortho Litho Film 2.0 is priced at 22 cents per sheet. Yes, I'd say it's priced remarkably cheaper than other B&W films, on par with the cost of the cheapest RC print paper. It remains to be seen if this replacement for my old friend APHS film is a viable alternative, given that its data sheet indicates the new film is even higher in contrast than the older stuff, possibly presenting an even greater problem with producing continuous tone images with manageable contrast. I'll have to order a pack, and experiment with it. I'll keep you posted of the results. Post-Script: I apologize for the small size of the lead-in image, it's all I could find online on short notice. 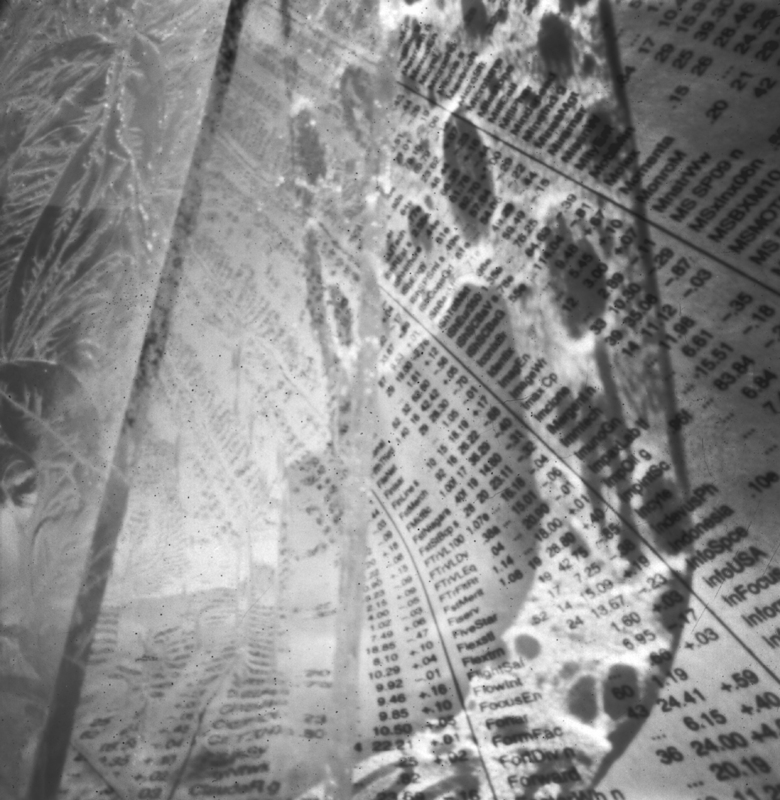 I'll find a higher-res version archived on my hard drives at a later date and update the image, which was a still-life with newspaper and textured glass, captured in the two-inch brass pinhole plate camera onto APHS film some years ago. I rescanned the original negative and posted a larger sized lead-in image. 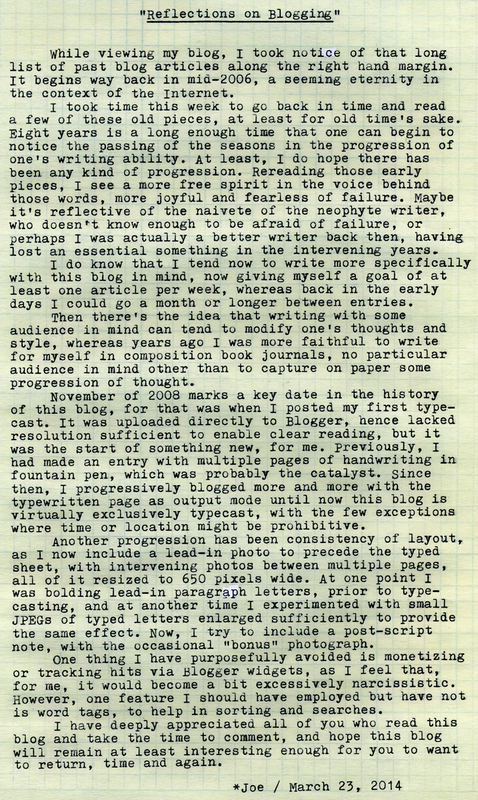 Post-Script: Another change that's taken place during the last eight years of this blog's life is that the place of blogging within the greater sphere of social media has been displaced by other, more abbreviated forms of communication that are less able to hold the attention of a potential audience longer than 140 character-long snippets. Not that tweeting and Instagram are a bad thing, but that they're a different thing from blogging, which remains, in my view, the best way for a person such as myself to present a more detailed, essay-like collection of thoughts to a wider audience. This week I've switched out the Olivetti Underwood 21 for the Royal Mercury, my beach typing machine. It's compact and lightweight, but is also a bit more tinny-sounding in operation. Also, the caps need their vertical position adjusted, something I've yet to attempt on this model of typewriter. Also, the lead-in image was a "screen print" from my iPad (you press the home and power buttons simultaneously and it copies the screen to the tablet's camera roll). Post-Script: New Mexico has a lengthy, convoluted history of rule by the Spanish, Mexican and US governments, mixed with strong native and Roman Catholic beliefs, and so it comes as little surprise that the local perspective on the history of European interaction with indigenous peoples would seem at times complex, even contradictory. I was reminded of this while visiting the Salinas National Monument, south of Albuquerque in central New Mexico, whereby a display placard informs the visitor that the local pueblo people "assisted" their Spanish "visitors" in the mining of salt from (relatively) nearby (if one were on horseback) dry salt lake-beds, ignoring the harsher implications of the term "conquest." Today, the descendants of those conquerors have themselves inhabited this rough landscape for so many centuries that their culture has become the de facto historical tradition. And so it goes, in an ancient land ruled over by so many for so long. Post-Script: Is this too far of a stretch from rambling on about one's choice of camera or bicycle to philosophizing about the future of mankind itself? Perhaps. Yet again, it is also possible that the role of toolmaker is essential and fundamental to who we are as a species, both in our distant origins and our future potential. Perhaps there is something to be said for using the right tool for the right job, after all. The lead-in photo was captured with a Fujifilm X10, hardly a state-of-the-art, high-end camera; yet in the context of an easily carried camera with image quality adequate for a snapshot aesthetic, it's more than adequate. Post-Script: Another display idea comes from having perused a local Mexican import shop and finding tiny decorative sheet-metal display boxes, no bigger than one's hand, each with a glass cover and space inside for one or more tiny images, like a shrine to oneself instead of The Virgin. Typecast via Olivetti Underwood 21, images via Lumix G5. I've been photographing this part of Albuquerque for a number of years, and have several notable images of this same building, taken at different angles and at different times. The Nob Hill District is an up-scale shopping and dining area that, because of the elevated real estate prices, makes it difficult for small boutique shops to remain profitable and in business. As such, the turnover can be quite high. One week I'll return after a hiatus and find some shop is closed up, white butcher paper covering its windows, with another shop soon to fill its empty shoes. Behind the fancy facade of boutique shops is the darker side, the service entrances accessed via alleys. I love alleyways, which I've written about previously. My more suburban neighborhood is devoid of alleys, but I have fond memories spent on weekends at my grandparents' house, where the alley behind their house was a constant source of entertainment for energetic young boys. Photographically, alleys possess a special allure for me, for they represent interstitials between public and private, serving also to divide neighborhoods and properties while offering access for services. In parts of town like Nob Hill and the University District to the west, alleys also become natural accessways for foot traffic, which presents opportunity to find public art as well as the detritus of the homeless, piles of clothes or shopping carts ladden with someone's personal effects. Sometimes it becomes difficult to tell the difference. There is intentional public art, like graffiti and stencil art that have become popular memes in the last few decades, especially around the University District with its surplus of young, restless people out and about, but there's also unintentional art. I was walking this alleyway in Nob Hill one recent winter's morning, camera in hand, and came across this window that I've seen so many times before, having also photographed it repeatedly from the other side. But this view resembled to me an abstract painting, given the white stucco wall surrounding the frame-like border. The only giveaway that this might be a window instead of a painting comes from the security company sticker afixed to the window's lower left corner. Unintentional or not, I enjoyed finding this window and its reflection as an artistic inspiration, and intend to keep an eye (or both eyes) keenly looking for more. Perhaps art is, after all, in the eye of the beholder. Post-Script: Photo via Fujifilm X10. Post-Script: There were other lessons to be learned from this kitchen remodel process, like ensuring you have all of your ideas settled beforehand, and learning, as a couple, to come to some middle ground of agreement, but also to know to trust the other person, who has just as much invested and at stake as you. We also learned that you can never be too picky about the details, they are important and you have to live with the consequences, but so too is trust. You have to let the workers finish their job, don't be too much of a micro-manager. After having prepared meals for a month out of my crowded office, I've learned that I could consolidate my typewriter table onto my main desk, which means I'll be able to get rid of that extra piece of furniture and make for more clear space in the office. Efficient use of space is one valuable lesson to learn when you're living in crowded quarters. A note about writing this blog article, I like to edit the HTML in order to resize the photos. Lately, doing so through a browser on the iPad has gotten more glitchy and problematic. I was forced, due to security issues, to upgrade my tablet's operating system recently to iOS7, a result being that neither Chrome or Safari plays well with editing a Blogger article's HTML. Even the Blogger app is pretty useless, since it doesn't provide for a way to edit photo sizes. I've had to fire up the old steam-powered desktop PC in order to finish editing this article. 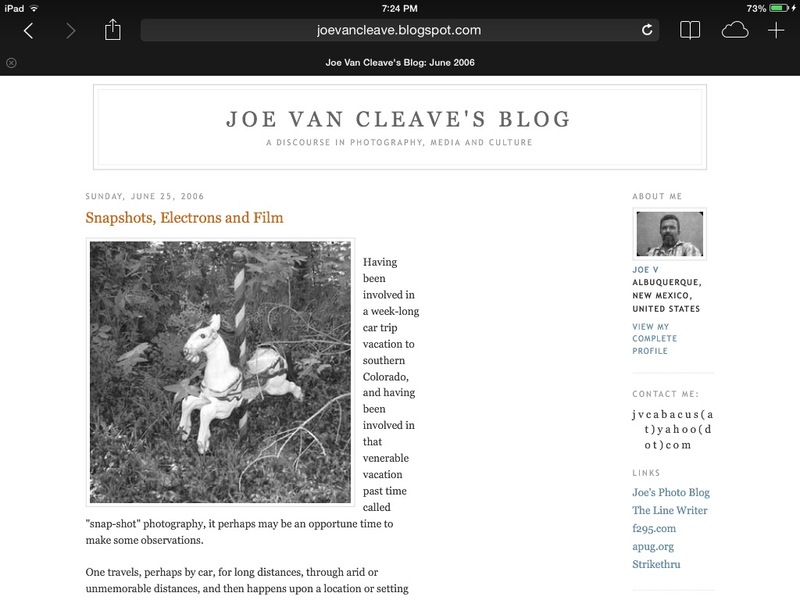 This problem with iOS and Blogger is going to make blogging while on vacation a lot more difficult. Typecast via Olivetti Underwood 21, photos via Fujifilm X10, edited in Filterstorm on iPad2. Doesn't that Lettera 22 look just marvelous on the new granite counter tops? Here's a set of more photos from our remodel, including a close-up shot of the old oven, before the remodel.